In a city in which noise can be all-encompassing, how can we find ways to listen to things that are hidden, stories that are unheard, and forms of life at risk of disappearing? This project invites artists and scholars from Lebanon and the UK to create works that sound out the spatial traces of memories, cultures, and bodies ingrained into the physical fabric of their cities. Each of these works encodes a methodology for listening and making audible phenomena that have otherwise been hidden or silent - whether through activating spaces acoustically, listening technologically beyond the surface of the daily lifeworld, asking for testimonies otherwise unspoken. The works offer listeners modes of language and tools to find forms of value in their surroundings that might otherwise go unnoticed, and to challenge the quality of their acoustic environments. In doing so, they will help to frame sound as a shared concern and a shared heritage that can be shaped as well as recorded. This edition is a collaboration between Institute for Global Prosperity UCL, Recomposing the City, RELIEF Centre, Optophono and Theatrum Mundi. It follows on from Recomposing the City and Theatrum Mundi’s 2018 exploratory workshop ‘Urban Sound and the Politics of Memory’. It forms part of the RELIEF Centre’s Cultural Committee programme, which began work on sound in 2018 with ‘Beirut Soundscape’. Silent Room 1. Illustration by Joseph Kai. The Silent Room is a site of absence located within the contemporary city. It is designed to exist alongside the familiar features of the 21st century metropolis: shops, street markets, office buildings, transport interchanges, traffic. The Silent Room proposes a space in which the quantity of information present in the contemporary urban environment is radically reduced. It frees you to see, hear and touch in a context of extreme spareness. As you enter the room, the visual cacophony of the city is dimmed out, replaced by subdued lighting and a fabric-upholstered interior. Aural stimulation is brought down to a minimum: the room is insulated against external sounds, and playing within is a non-intrusive recording of the city at its calmest moments. Silent Room 1. Drawing by BÜF architecture. Documentation of Silent Room 1 (2017) by Nathalie Harb. In collaboration with musician Khaled Yassine, Acoustic consultants 21dB and architects BÜF Architecture. Drawings and illustrations of Silent Room 1 by Joseph Kai. Silent Room 1 was first shown as part of Beirut Design Week in 2017. Silent Room 2 was partly commissioned by the London Design Biennale 2018 to represent the Lebanese Pavilion. The Egg is a derelict building located in the heart of the Beirut, just south of Martyr Square along what was the front line between the Eastern and Western parts of the city. As a consequence, the structure is ravaged with bullet holes and has large parts shoaled off by sustained artillery fire. City of Impulse is a filmic edit of slow walks through The Egg, recording the crumbling building, its visual scars, the remnants of what was before and after and the fast changing urban fabric that surrounds it. The film’s soundtrack is a hyper-real version of the city as it sinks into and bounces off the structure. Sounds morph from deafening streetscapes to hollow flutter echoes inside the actual cinema. A subsonic blanket of heavy traffic fused with high-pitched bird-song at the base of the destroyed tower fades to echoic and cavernous drips and clangs inside the flooded underground car park. Spatially and psychologically distinct parts of the city are layered, fused and laced with the otherworldly acoustics of The Egg’s physical structure. City of Impulse (2018) by Merijn Royaards. City of Impulse also exists as a open-access library of recordings made inside and around the Egg, which can be used to reconstruct its architecture sonically, to process other sounds, or as source material for the construction of original sound works. Teggno is a track that uses these recordings to try and communicate my experience of The Egg, its raw energy, resonance and hyper-reality. Originally presented as part of Beirut: City of Impulse, Bartlett School of Architecture/Here East, Summer 2018. In 2017 the curator Amanda Abi Khalil of the Temporary Art Platform (T.A.P.) invited me and 6 other artists to take part in a two-day awareness campaign for Al Dalieh, a part of Beirut's coastline that was facing privatization. The area is frequented by all sorts of people, from fishermen, swimmers, and those who just want to escape Beirut's chaotic daily life. The work I presented, The Invisible Soundtrack, was a listening post at which one could hear sounds I recorded from the area that go unnoticed. The most intriguing of these sounds were those of the underwater life off the coastline, which you can hear here. Originally presented as part of Art Interventions on the Dalieh of Raouche, curated by Temporary Art Platform in collaboration with The Civil Campaign to Protect the Dalieh of Raouche, 19-21 May 2017. For this project I took recordings I had previously made of instrumentalists in controlled studio settings and resituated them in the natural landscape of Nunhead Cemetery in Southwark, Southeast London. Nunhead Cemetery is one of the ‘Magnificent Seven’ group of Victorian cemeteries in London. It is known for its unkempt, wild setting as a nature preserve. The cemetery has a rich soundscape composed of birdsong, the sounds of wildlife, tourists, visitors, airplanes flying overhead, and the sounds of the city nearby. I placed a wireless speaker in different parts of the cemetery—in buildings, tombstones, and trees—and played the studio recordings into these spaces. I weaved the studio recordings into the natural soundscape of the cemetery, listening for cues from wildlife, passers-by, and other sounds that occurred, and recorded this process. I used the acoustic of the cemetery’s architectures, notably the Anglican Chapel, a ruined chapel whose walls are intact but whose roof is missing, the result of an arson attack in the early 1970s. Back in the studio I tried to recreate the subtlety of listening to the recordings in the natural environment of the cemetery, and used delicate mixing and editing processes in recomposing these sounds. In the 2006 war on Lebanon, the consultative council in the southern suburb was razed to the floor, where all its components were pulverized. Meanwhile, the underground floors were left intact, due to the protective nature of the thick concrete slab that was used on the ground floor. This prompted an engineer working for the Hezbollah affiliate reconstruction team to claim that this building was hit by a Thermobaric Bomb or, as he put it, a ‘vacuum bomb’. A thermobaric bomb is an unusual type of explosive that doesn't incorporate oxygen molecules, thus requiring atmospheric oxygen. This bomb explodes twice, initially releasing white gas particles that penetrate the porosities of a physical structure. Afterwards, these particles rapidly burn in the surrounding air later in time, thus resulting in an intense fireball (reaching 1500 C to 2200 C) and a high blast overpressure action (compressive strength greater than 45000 psi). Excerpt from 50 cm Slab (2018) by Mhamad Safa. Points of Contact exhibit, Goethe-Institut Libanon, Beirut, 2018. Originally presented as part ‘Points of Contact’ exhibition curated by Helene Kazan, Goethe-Institut Libanon, Beirut, 27 January - 10 March 2018. With thanks to Helene Kazan, Sabine Saba, and Ziad Moukarzel. Still from Public Hearing 02: Interview 1 (2019) by Joan Baz. See English translation of ‘Interview 1’. 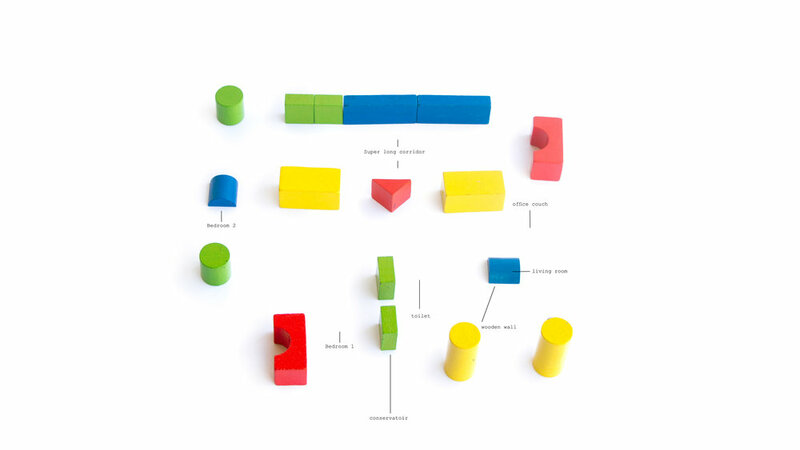 Public Hearing 02: dwelling on dwelling is an ongoing experiment which uses simple building block toys to investigate the relationship between memory and space. The work consists of a series of one-on-one conversations with individuals who are asked to simply remember a place they have once lived in and to use the set of building blocks to construct that place. This begins to create a space for an intimate conversation to take place. As they build the blocks, some choose to remember a room they've lived in, or a kitchen in a house they've shared, or the entrance in their parents’ home... the individuals use recollections of personal narratives and fragments of memory to dwell on the nature of dwelling. In some way, these conversations, which exist beyond time and space become testimonials of lives lived in constant state of flux, and more broadly a space to reflect on movement and migration. Below you can listen to audio or watch video from the series Public Hearing 02. You can also download an interactive, software-based version of Public Hearing 02 (for Mac only). Still from Public Hearing 02: Interview 2 (2019) by Joan Baz. “En Dash” is an experiment that explores the act of singing while walking in the city. With a recorder in hand, I wandered around Beirut capturing some vocal improvisations of a pre-written tune, and the multiple transformations it undergoes, when moving from one neighborhood to another. While I usually sing to block external sounds and create for myself a safe shielding sonic space, I found myself crossing over to an already established amalgam of sonic occurrences, blurring the boundaries in-between my personal space and the public sonic atmosphere. What appeared as “noise” revealed an array of synchronicities and meta-schemes, unveiling a musical flow that re-questions the haphazardness of it all. Landline is a guided exercise of gratitude designed for today’s fast paced life. It is the first episode of an ongoing series that employs different sounds concocted for an experience as the urban walker of the 21st century, acknowledging the difficult act of migrating within and throughout the city. This audio-visual essay asks what role non-human life plays in Beirut’s public realm. Observed from an outsider’s perspective, it reflects on the different ways that other life forms are both put to work and take up space in Beirut. The materials were recorded on a walk through Gemmayzeh, Geitawi, and Qobayat during Theatrum Mundi and Recomposing the City’s 2018 research networking trip to Beirut. Though this is just one part of the city, the questions raised could apply anywhere. Inspired by the works contributed by Nathalie Harb and Nadim Mishlawi to this edition, that we first heard during the 2018 trip, I wanted to pay attention to the ways that listening to quiet sounds could make acoustic space without imposing silence on the city. By putting noise in the background, they suggest different modes of attention. These modes of listening have wider implications. Can we think of democracy as something that allows component parts of a social system that could otherwise be drowned out to be made audible? 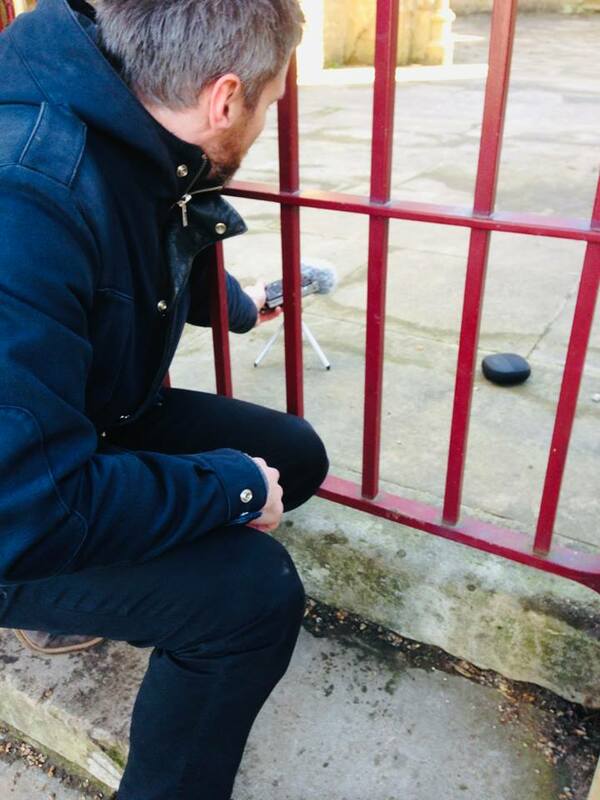 While conducting fieldwork on musical audiences in London, I became interested in using field recording as a research method. Listening to my field recordings at home after a night out, I was often amazed at the small, forgotten moments that my iPhone had managed to capture: the mediation of sounds through the physical materials of a spatial environment; the jubilant collectivising energy that spreads across a room when a well-loved tune edges into audibility; the levels of shouting over the music and expressions of exasperation and disgust at the crowdedness of an event. It struck me that these kinds of audibility acted as a valuable way of knowing and understanding the texture of the urban social world and its musical and sonic environments. This piece explores these ideas through a field recording exchange with Freya Johnson Ross. The first three and a half minutes were originally included as part of a larger piece by Freya and I titled ‘I Mean They’re Not Actually Caverns’, presented at the Eavesdropping Symposium in London, 2018. This edition is a collaboration between Institute for Global Prosperity UCL, Recomposing the City, RELIEF Centre, Optophono, and Theatrum Mundi. We are grateful to all the artists who have generously contributed to this edition, and to our collaborators and sponsors for supporting this edition. Special thanks to Howayda Al-Harithy, Amanda Abi Khalil, Nathalie Harb, Tom Hughes, Gerard Gormley, Sarah Lappin, Henrietta L. Moore, Ibrahim Nehme, Rachel O’Grady, Miguel Ortiz, Elisabetta Pietrostefani, Richard Sennett, and Sasha Usseff for their support of this project.